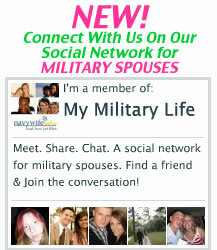 2 Sept 08 – Navy Wife Radio is LIVE tonight at 9pmET. Be sure to join us live or on demand. Tonight we welcome journalist, life coach and radio show host Anita Doberman. Anita is also a military wife and mom of six children. Originally from Rome, Italy, her columns reflect her unique perspective and will leave you smiling. Join us for some laughs and her thoughts on making the most out of this military life we are living. At last check of her website, she recently interviewed Michelle Obama for military.com. You don’t want to miss this fun show!! Plus, we are taking your calls and questions!